Add a touch of ladylike charm with lace, ruffles and bows. I'm typically not attracted to lace clothing, but I wanted to challenge myself to come up with a look that incorporated the tricky fabric. Last Christmas my mom gave me a lace dress that belonged to my great great aunt in the '20s. I cherish the dress (its slightly yellowed color, its distinctly sweet, musky smell) but had never actually worn it. Apparently I didn't inherit my small stature from the original owner of the dress, but with some strategic gathering and tucking, I got it to fit. 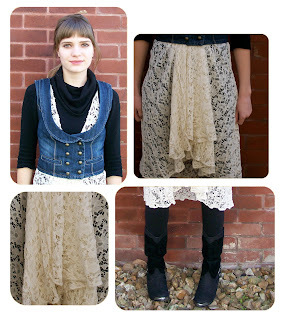 Though it's not really my style, I like how black lace or white lace worn with black has a dramatic, gothic feel. A look with layers upon layers of ruffles is fun, girly and decadent, calling to mind cupcakes with pink frosting, strands of pearls, teacups, poodles and all things sweet and nice. Pair with more structured pieces to balance the look. 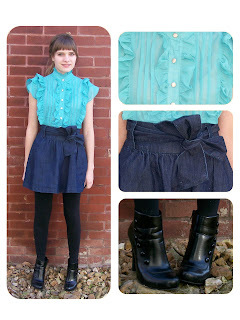 Make a statement with an oversize bow around your neck or waist. As with ruffles, go for excess. The bigger the better. 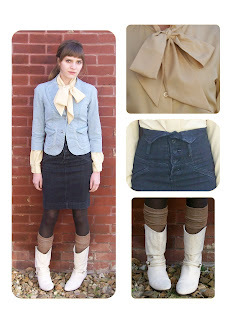 I love the vintage secretary feel of this look. On the Runway: Prada Fall 2008 RTW. Image source: Style.com. On the Runway: Alexander McQueen Fall 2008 RTW. Image source: Style.com. On the Runway: Francesco Scognamiglio Fall 2008 RTW. Image source: Style.com.